The Food and Drug Administration has approved Amgen's (AMGN) osteoporosis drug denosumab for use by cancer patients with solid tumors whose disease has metastasized to their bones. The indication to prevent bone complications, such as fractures and bone pain, among those patients could boost the drug's sales by billions. 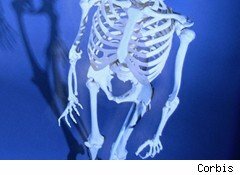 Denosumab was originally approved in June under the name Prolia as a treatment for osteoporosis among postmenopausal women. But sales under that indication have been disappointing. The new indication, which uses higher and more frequent dosing, will be marketed under the name Xgeva, and opens the cancer treatment market for the Thousand Oaks, Calif.-based biotech. "Bone metastases represent a major cause of pain and suffering in patients with cancer and can affect a patient's quality of life," said Dr. Richard Pazdur, director of the FDA's Office of Oncology Drug Products. The weakened bones can lead to fractures and compression of the spinal cord, and necessitate procedures like surgery and radiation. Denosumab, a monoclonal human antibody which was approved under a priority review, binds the protein essential for the formation, function and survival of the cells that break down bone. It is believed to prevent cancer-induced bone destruction, regardless of cancer type. "As many as 3 out of 4 patients with advanced prostate, lung, and breast cancer will experience spread to their bones," said Dr. David Henry, a professor of medicine at the University of Pennsylvania, and of the department of medicine at Pennsylvania Hospital. Henry expects Xgeva to "quickly become a mainstay of cancer care." Three late-phase studies in 5,723 patients spanning 50 tumor types compared Xgeva with Novartis's (NVS) Zometa. In the two trials involving patients with breast or prostate cancer and bone metastases, Xgeva was superior to Zometa in reducing bone complications. In the third trial in patients with other types of solid tumors and multiple myeloma, Xgeva was found to be equally effective as Zometa. The world's largest biotechnology company has been looking to denosumab for growth. Zometa had 2009 sales of $1.5 billion. Xgeva should add at least $1 billion in annual sales, and may reach sales of $2.4 billion in 2015, according to Citigroup analyst Yaron Werber, Bloomberg reports. The most serious side effects experienced with Xgeva were low calcium levels in the blood, and osteonecrosis of the jaw, a severe disease causing pain, swelling, numbness and infection. The total economic burden of patients with bone metastases on the U.S. economy alone is estimated to be $12.6 billion annually, Amgen said. Xgeva could help reduce that cost. It will cost $1,650 per month, or $19,800 a year, wholesale. And for patients struggling financially, Amgen offers aid programs. Amgen shares at first reacted positively to the news, but as many expected the approval and had priced in the potential, the reaction among investors has been muted, and shares were 0.4% lower in early afternoon trading.